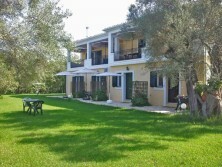 In the beautiful and picturesque location of Agios Ioannis in Lefkada, you will find the Studios Niki. The complex consists of apartments and studios. Nestled in the bosom of the beautiful olive grove of Lefkada, the complex Studios Niki is located in the middle of a large, lush estate of four (4) acres, paved from end to end with grass, flowers and trees, and full of perennial olive trees. In a distance of only 700 meters from the famous beach of Agios Ioannis which is featured as an area of special natural beauty and famous for its crystal clear blue waters. It is rewarded with blue flag.